Dish Network still reached no agreement with the television channels of WDAZ and WDAY and the next deadline is at noon on 12th October. If you are a customer of Dish Network and you see programming of WDAY and WDAZ on Dish Network then you can loose your yourite TV shows of WDAY and WDAZ on next Monday afternoon of October12. WDAY and Dish Network are in negotiations on a new agreement and still they do not reached to the desire agreement, WDAY said in a statement that the extension that they set expired on late September 30. So to achieve an agreement with Dish Network, WDAY set a new deadline of noon October 12. WDAY said that if no agreement occurs between them then WDAY and WDAZ will go blank for Dish Network customers. As we can see these cases often when the satellite TV providers that various channels fails to reach an agreement on new contracts in a timely manner, so that the TV channels on satellite TV providers stop broadcasting their channels. Here both Dish network and WDAY both sides are trying to win the public relations battle. Dish Network has a new television channel, #7, between the channel of WDAY at channel number 6and TV channel of WDAZ at channel number8. Viewers of Dish network TV service when click on them they can read a paragraph about how Dish Network is in the right, and WDAY is wrong. Meanwhile, in its press release WDAY indicates that Dish Network is trying to convince customers that the negotiations is a question of money. WDAY said that this is not the case and that all local subsidiaries of Dish Network to cost less than sports channel to their customers. 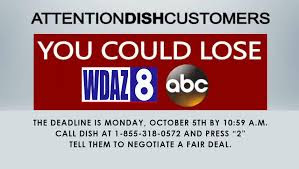 WDAZ encourages interested viewers of Dish Network to contact Dish network custom care number at 855-318-0572 and press # 2 in connection and tell Dish Network to negotiate a fair deal with WDAY to enjoy uninterpreted television channels of WDAY and WDAZ . Here is the list of Sat Keys, Sat Files and Powervu keys of All PowerVu channels C Band and KU Band Satellites. As you know here in this website we offer all possible available sat keys of different TV channels. Today we are going to share the PowerVU keys of all popular TV channels available via C-band or KU-band satellite signals. Yahsat Satellite is becoming Best Satellite as it added 22 Pakistani TV channels. Here you will find all Yahsat Satellite Frequencies, yahsat dish direction and info on installing satellite TV to get Pakistani TV channels from Yahsat 1A. Yahsat has a number of good TV channels broadcasting popular sat tv program on sat tv. To receive Yahsat 1A you need a KU band Dish Antenna and a MPEG 4 satellite set top box. Installing satellite TV is easy if you know how does satellite tv work? Satellite tv network broadcast TV signals via a geostationary satellite to earth that we can receive with the help of a dish antenna. So, installing satellite TV for yahsat channel list will become easy if you knew the yahsat dish direction which is 52.5 degree East. Here is complete list of Best Satellite Yahsat channel list with Yahsat frequency and yahsat pakistan channels list. Complete Paksat channel listPaksat 1R satellite TV channels with Frequency. Free to air channels list of paksat 1r satellite tv channels. Paksat 1r is the Asian Hotbird having most of the Free to air channels. The most of the channels of this paksat satellite are in Urdu or English and contain a good package of TV channels of all sort of entertainment. As many readers of this site asked me about the satellite tv frequency of Paksat satellite, so I decided to give a full list of Paksat 1R satellite channels with satellite frequency. So without taking much of your time here is the complete FTA channels list of paksat 1r of both C-band and paksat 1r Ku-band channels list. 3 Sports TV Channel Now Started on Yahsat 1A at 52.5° East. Update: 3 sports FTA cricket sports channels moved to Afghansat 48E. Good news for Sports TV channels lovers, a new FTA sports channel 3 Sports channel now started transmission on Yahsat-1A at 52.5° East in Ku Band. 3 sports TV previously available at yamal 49 E, then shifted to Afghansat and finally now moved to Yahsat at 52.2 East. Yahsat is also popular for Hollywood TV channels, the popular TV channels of MBC network, also have TV channels of GEM network with almost all TV content from Fashion TV to Hollywood, Bollywood TV, WWE, cartoon TV and now a sport TV channel. So, if you are in the satellite footprint, i suggest you to track this TV satellite for HD TV channels and all free to air TV channels. Find more about Yahsat TV channels from here. All Channels Of PakSat 38 East including Geo tv frequency, Samaa tv frequency on Paksat, Geo news Urdu frequency and full channel list updated. Paksat 38 which is also known as Paksat 1R is a popular satellite TV service provider in Asia. Many sat-tv website users were asking for Dunya news frequency, Geo tv frequency, Paksat 1r dish setting etc, so I decided to share all available channel list of Paksat 38 along with frequency. Download latest firmware software of STARSAT SR-2000HD HYPER for free company CCam server. STARSAT SR-2000HD HYPER is most powerful digital set top box having WiFi,3G,IPTV, HD Satellite Receiver. Key features of STARSAT SR-2000HD HYPER set top box. Free to Air, DVR/Hard Drive Recorder, Internet/Media Streamer, Simultaneous Record and Play, Record and Watch in HD. Detail Features of STARSAT SR-2000HD HYPER STB (Set top box). SCPC & MCPC receivable from Ku and C band satellites. Universal, Single, Single S & C Band Wideband LNB. Compatible Code Rates: 1/2, 3/5, 2/3, 3/4, 4/5, 5/6, 7/8, 8/9 and 9/10. Multi satellite search, network search, Multi tp search. Variable aspect ratio(4:3, 16:9) with PAN & SCAN vector or letter box option. Nilesat Satellite frequency. Here is a complete list of Nilesat satellite channels and Nilesat satellite frequencies As you know Nilesat is a popular satellite TV service having hundred of good and popular TV channels. The Nilesat satellite TV service is meant for West but it can be received able in Asia and as well as in India, Pakistan, Saudi Arabia and other countries with a bigger satellite TV dish antennas. Nilesat satellite dish position is at 7 degrees West and for Nilesat satellite settings you need to install the dish antenna at the prime location of 7 degrees West to tune its channels. If you need Nilesat satellite channels list and Nilesat satellite frequency to tune to this KU band satellite TV service Then Here is the complete list of Nilesat TV channels list with frequency setting. Nilesat satellite dish setup how to align Nilesat 7.0 West with easy step by step guide so that you may not face any problem in adjusting satellite dish yourself. Nilesat 7W is one of the best and popular TV satellite in Pakistan, India, and especially in the Middle East. You can watch best TV channels on Nilesat such as National Geographic Abu Dhabi, Imagine movies, Zee Aflam and much more. Many people tried to Align their dish antennas towards Nilesat. But it is not an easy work to install satellite dish and align Nilesat as you have to work hard to find this TV satellite. For readers of Pakistan and India who want to point their dish at Nilesat, they will need at least 6 feet or bigger KU band dish antenna to receive Nilesat signals. Middleast people can use 4 to 6 feet KU band dish antenna. ABS 1 channel list 2017. 88 Free To Air Ku Band TV Channels on ABS 2. Ku band TV satellite easily receivable on 70cm KU dish antenna. Here is the full list of updated FTA TV channels of ABS 2 Free Dish with Frequency, TP. ABS2 at 75 East FTA Channel List with frequency, tp updated on 28 Feb 2016. Here is the latest television channel List of ABS 2 at 75 degrees East updated on 28 February 2016, ABS TV package is Free to Air in Ku Band TP on popular Russian satellite TV SAT ABS2 at 75 east. ABS 2 is a Russian TV satellite but these TV channels are on Indian beam. So, we can easily receive these KU band frequencies in India, Pakistan, Bangladesh, Nepal And nearby countries with only a small dish size of 70cm or above. The signal strength of Asia sat3s is just like insat 4 b/nss6. Around above 65... You can easily catch on your dd dth dish and receiver. AsiaSat 3S provide a good coverage for the East Asia and South Asia region. It is really easy to catch... If you have a NSS6/InsatB Ku band dish just move to left side...(north side) signals come easily.